Apple has released a brand new update of third developer beta of iOS 11. However, there is something suspicious in it. The latest update of iOS 11 has addition to a “Start Broadcast” button. The button has led everyone to guesses on what it might be. However some speculations suggests that this button is possibly intended for sharing the phone’s display during a livestream, has been added in the latest iOS 11 developer beta. There are several guesses going on regarding this new button’s functionality. However, the Start Broadcast button doesn’t do anything currently, and if you tap it, the screen only records locally, with the file being saved to the gadget’s camera roll. Some reports have hints that it is meant for AirPlay. But this doesn’t make sense since the button for AirPlay is already there on Control Center. 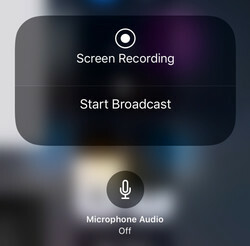 However, it’s also possible that the record button could be for the third-party apps which want to influence the ability to record an iPhone’s display. The user will be able to share screen to a YouTube or Facebook livestream after pressing the button.